Link's next outing after Skyward Sword will be an original Zelda tale in 3D. Eiji Aonuma, the famed game designer most famous for his continuing work on the Zelda series, has revealed that Nintendo is hard at work on a new installment for the 3DS. He has also confirmed that game will be the next Zelda title available on the handheld, being prioritized over the possible Majora's Mask port the company has been eying as well. "Recently, we released The Legend of Zelda: Ocarina of Time 3D as a remake," Aonuma told Portugese gaming site MyGames, as later translated by Nintendo Everything. "We are considering the idea [of porting Majora's Mask], but it didn't seem right to launch a remake one after another, so the next Zelda game on 3DS will be original." 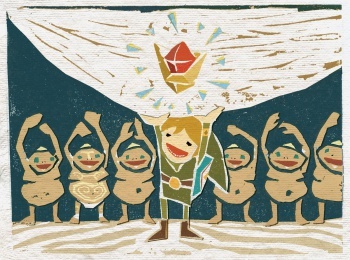 Zelda games have a long history with quirky timelines, and while there are few true sequels in the series, some games were definitely meant to follows others, such as the Phantom Hourglass's continuation of Wind Waker. While this announcement is a bit light on the details, Aonuma did go on to confirm that the new game wouldn't be a direct continuation of either two previous DS titles Phantom Hourglass or Spirit Tracks, saying, "We are talking about a new game, but it takes much of what has been done on previous handhelds." There's no further information regarding the premise of the game, whether it will be a spiritual tie-in to the upcoming Skyward Sword, or when Nintendo will be rolling it out, but at least we know it's next in line. It's hard to say if this was part of Nintendo president Satoru Iwata's recently announced purposeful game delaying tactic, but these days most 3DS owners are likely to rejoice just knowing that some original, quality content for their console is on the way.